1.4 If you do not agree to these terms, you must not use our website. 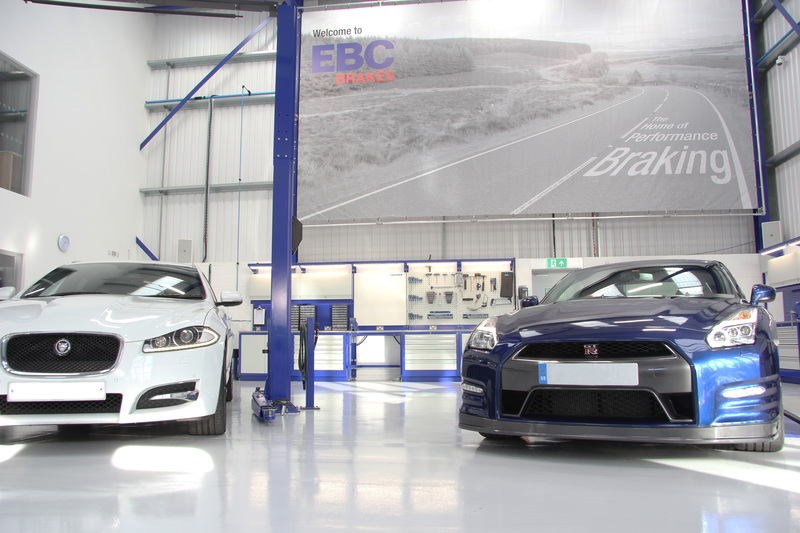 3.1 This website is operated by EBC Brakes Direct Ltd.
3.2 EBC Brakes Direct Ltd are registered in England and Wales under company number 4835479 and our registered address is EBC Brakes World Headquarters, Upton Valley Way East, Northampton NN4 9EF. Our VAT number is 816150356. 3.3 Our contact telephone number is 01604 286028 and our contact email address is sales@ebcbrakesdirect.com. 3.3 We are a distributor of automotive/motorcycle/cycle brake and clutch products. 5.1 We may update our site from time to time, and may change the content at any time, However, please note that any of the content on our site may be out f date at any given time, and we are under no obligation to update it. 6.5 Our site is directed to people residing in the United Kingdom. We do not represent the content available on or through our site is appropriate or available in other locations. We may limit the availability of our site or any service or product described on our site to any person or geographic area at any time. If you choose to access our site from outside the United Kingdom, you do so at your own risk. (g) access or attempt to access the accounts of other users or penetrate or attempt to penetrate our site's security measures. 8.1 If you choose, or are provided with, a user identification code, password or any other piece of information as part of our security procedures, you must treat such information as confidential. You must not disclose it to any third party. 8.3 If you know or suspect that anyone other than you knows your user identification code or password, you must promptly notify us at sales@ebcbrakesdirect.com. 9.1 We are the owner or the licensee of all intellectual property rights in our site, and in the material published on it. Those works are protected y copyright laws and treaties around the world. All such rights are reserved. 9.2 You may print off one copy, and may download extracts, of any page(s) from our site for your personal use and may draw the attention of others within your organisation to content posted on our site. 9.3 You must not modify the paper or digital copies of any materials you have printed off or downloaded in any way, and you must not use any illustrations, photographs, video or audio sequences or any graphics separately from any accompanying text. 9.5 You must not use any part of the content on our site for commercial purposes without obtaining a licence to do so from us or our licensors. 10.1 The content on our site is provided on an 'as is' basis and is for general information only. It is not intended to amount to advice on which you should reply. You must obtain professional or specialist advice before taking, or refraining from, any action on the basis of the content on our site. 11.1 To the extent permitted by law, we exclude all conditions, warranties, representations or other terms which may apply to our site or any content on it, whether express or implied. 11.5 If you are a consumer user, please note that we only provide our site for domestic and private use. You agree not to use our site for any commercial or business purposes, and we have no liability to you for any loss of profit, loss of business, business interruption, or loss of business opportunity. 11.6 We will not be liable for any loss or damage caused by a virus, distributed denial-of-service attack, or other technologically harmful material that may infect your computer equipment, computer programmes, data or other proprietary material due to your use of our site or to your downloading of any content on it, or on any website linked to it. 11.7 We assume no responsibility for the content of websites linked on our site. Such links should not be interpreted as endorsement by us of those linked websites. We will not be liable for any loss or damage that may arise from your use of them. 12.3 You must not misuse our site by knowingly introducing viruses, trojans, worms, logic bombs or other material which is malicious or technologically harmful. You must not attempt to gain unauthorised access to our site, the server on which our site is stored or any server, computer or database connected to our site. You must not attack our site via a denial-of-service attach or a distributed denial-of-service attach. By breaching this provision, you would commit a criminal offence under the Computer Misuse Act 1990. We will report any such breach to the relevant law enforcement authorities and we will co-operate with those authorities by disclosing your identity to them. In the event of such a breach, your right to use our site will cease immediately. 13.2 You must not astonish a link in such a way as to suggest any form of association, approval or endorsement on our part where none exists. 13.6 The website in which you are linking must comply in all respects with the content standards set out in Clause 7 above. 13.7 If you wish to make any use of content on our site other than that set out above, please contact sales@ebcbrakesdirect.com. 16.1 All trade marks used on our site are UK trade marks of EBD Brakes Direct Ltd or our licensors and are our property or the property of our licensors. Such trade marks include, but are not limited to, EBC Brakes, EBC Brakes Direct, Ultimax, Greenstuff, Redstuff, Yellowstiff, Bluestuff, Orangestuff and Double-H. You may not use any of the trade marks used on our site unless as expressly permitted on our site or you have our prior written consent. 17.1 To contact us, please email sales@ebcbrakesdirect.com. 1.1 A contract for the sale of product(s) you order from us is only created once we have despatched your goods to you. A confirmation of your order will be sent prior to this, but it is not an acceptance of order, we are merely confirming the order details that you have requested and indicating a likely despatch date for those items. Orders are subject to availability. Whilst every effort is made to ensure the data contained on the website is correct, we will not be legally bound by any factual or typographical errors on the website or other promotional materials. Should you wish to cancel your order with us, you can do so by sending an email to cancel.order@ebcbrakesdirect.com. You must quote your order reference number on ALL correspondence, you also need to include your name, home address, delivery address of the goods if different to home address, contact details and a description of the items to be cancelled or state whole order. As long as your order has not been shipped, there will be no cost to you. If you order has already been despatched, you can still return it, but under the guidelines given in "EU Distance Selling Law". We reserve the right to refuse any order without providing any justification. 2.1 The prices shown on the web site show excluding VAT and including VAT costs per item. They do not include postage and packaging. Postage and packaging is shown separately, once you add an item or items to your shopping cart. Postage and packing charges are initially shown as a guide for delivery cost per item, per product type to the UK mainland only. If you only order one product, then this is the cost that you will pay for delivery into UK mainland. If you order more than one product, then the cost will be calculated in the shopping cart. There is also a delivery table charge by weight. Costs quote for all UK Royal Mail services are actual costs inclusive of VAT. The costs shown for UPS services are a guide only, and the costs are not inclusive of VAT. 2.2 VAT. All goods shipped to the UK or within the EC will have VAT applied to them at the standard UK rate of 17.5%. Goods shipped to countries outside of the EC will not have VAT applied to the cost. Import duties and or taxes may be applied when you receive your delivery. We are not responsible for these additional costs, you the customer are. You should seek advice on how much, if any, these costs will be from your local customs office. When paying online for your goods and you are viewing the pricing in either Great Britain Pounds, Euros or US Dollars, you can expect the amount charged to be very close to the amount shown on the web site. This will not however, take into consideration any conversion charges your card issuer may charge you. 2.4 Once the goods have been delivered to you, you will hold them at your own risk and will be liable for their loss or destruction. 3.1 When paying by postal cheque, goods will not be despatched until funds have cleared. Cheques will only be deposited into the bank, if we have stock of the item/s ordered. 3.2 When paying via credit card or debit card, payment will not be taken until we are ready to despatch your goods. 3.3 If you have paid via credit card or debit card for multiple items and an item or items are out of stock and the estimated delivery date is not acceptable for one of the items the value of the item will be credited back to the card that the initial payment was taken from. 3.4 If you have paid by cheque for one item and it is out of stock and the estimated delivery date is not acceptable, your cheque will be returned to you. 3.5 If you have paid by cheque for multiple items and an item or items are out of stock and the estimated delivery date is not acceptable for one of the items, your cheque will be deposited into the bank. A cheque made payable to you will refund any difference and will be posted to you once your cheque has cleared. 3.6 Goods remain the property of EBC Brakes Direct Limited until they are paid for in full. 3.7 ANY ATTEMPT TO FRAUDULENTLY MISUSE ANY FORM OF PAYMENT WILL BE REPORTED TO THE RELEVANT AUTHORITIES, IN THE RELEVANT COUNTRY, IMMEDIATELY. WE WILL ASSIST THE INVESTIGATING PARTIES IN EVERY FORM POSSIBLE. 4.1 For UK mainland deliveries, once you have placed your order, you can expect delivery within the next two to three working days. All deliveries must be signed for. For overseas orders, the estimated delivery time will be dependant on your location and chosen delivery method. This is providing that your preferred payment method has cleared the necessary funds at time of order. If an order is placed outside of our normal business hours, then the delivery time will start from the next working business day. That is, if an order placed on Saturday, the order will be processed on Monday and should be delivered by Wednesday. 4.2 For all Parcel Force deliveries, you will be able to monitor their progress via Parcel Force’s tracking services. We are not responsible for any outages of this service. If this happens, we will endeavour to help resolve your delivery query via other means with Parcel Force. 4.3 For all UK Royal Mail deliveries, tracking is available. Items sent recorded delivery, you are only able to view or confirm the status of the delivery, once it has been signed for. For items sent Special Delivery, you will be able to track the delivery route online. This service is provided via Royal Mail tracking services. We are not responsible for any outages of this service. If this happens, we will endeavour to help resolve your delivery query via other means with Royal Mail. 4.4 Where goods are not in stock, customers will be notified in the first instance via email, with an estimated date of delivery. If this estimated delivery date is acceptable to you, your order will be processed as normal once we have your items ready for shipping. Parcel Force 24 – If your delivery address is NOT contained within Royal Mail’s postcode address database at the time of order, no delivery guarantee is applicable. Delayed delivery compensation will be limited to 50% of the original amount paid. If a shipping discount has already been applied to the order, no delayed delivery compensation will be offered. Parcel Force 48 – We do not offer a delivery guarantee for this service. If you find that the goods appear to have been damaged during shipping, you must notify us in writing within 5 days of delivery. No shipping damage claims will be accepted after 5 days of the goods being delivered. This can be via email, letter posted to our address or by fax. You must quote your order reference number on ALL correspondence, you also need to include your name, home address, delivery address of the goods if different to home address, contact details and a description of the damage to which items ordered. Once we have received this written confirmation, we will arrange a mutually convenient time and date to collect the goods. Once the goods have been delivered to us, we will complete an inspection. After confirmation of your claim we will either refund your payment or arrange for a replacement item to be shipped to you. Subject to sufficient shipping insurance cover. Where it has been proven that the courier company is responsible for the loss or damage to your goods, they will only be responsible up to the level of insurance you have specified. EBC Brakes Direct Limited will not be liable for any difference between your chosen insured value and the value of the goods ordered or value of the goods delivered. If you have incorrectly order the wrong item for your car, bike, kart or mountain bike, we can exchange the goods for the correct ones. This will be subject to a minimum restocking fee of 20% of the goods value. Product boxes that have been opened cannot be re-sold to the public. You will also be responsible for shipping the goods back to us and for the shipping of the correct goods back to you. If there is a difference in price for the correct goods you will be charged or credited, depending on the prices. Any goods deemed to be incorrect in any way you must notify us within 30 days from the date of the invoice. No exchanges or refunds will be given after this date. If we have incorrectly sent you the wrong goods, i.e. the product code that you have ordered, does not match the product code of the item that you have received, we will arrange for collection of the goods and replace with the correct item free of any charges. We will also offer you FREE shipping (to the same delivery address) on your next order our way of apologising, as it should not happen. Any goods deemed to be incorrect in any way you must notify us within 30 days from the date of the invoice. No exchanges or refunds will be given after this date. Under the "EU Distance Selling" laws, you the consumer have a right to cancel the order, within 7 working days. This can be via email, letter posted to our address or by fax. Should you wish to do this, you will be responsible for the item/s to be returned to us in their original UNOPENED packaging. Once the items have been returned to us they will be inspected for any damage. Providing that there is no damage, you will be credited the amount paid for the goods excluding the original courier delivery costs, in the same way that we received the funds from you. This process will happen within 30 days of us receiving your returned goods. If you have used the goods in anyway or opened the product boxes, you have deemed to accept the goods and the goods cannot be returned under "right to cancel" guidelines above. If the packaging has been opened, and you wish to return the goods, under the "Right to Cancel", then the goods can still be returned as outlined above, but will be subject to minimum 20% restocking fee. Once goods have been opened it is illegal to sell them to another consumer again unless they have been re-boxed, in new packaging. Goods purchased from us, which are now no longer required, may only be returned to us within 7 working days from the date of delivery. Within this time frame, unwanted items can be return to us under the “EU Distance Selling Laws”. Should the products arrive, and they are clearly faulty, then you should contact us in writing within 5 days of delivery. We will accept no faulty goods claims, after 5 days of the goods being delivered. This does not affect your warranty with the original manufacturer. This can be via email, letter posted to our address or by fax. You must quote your order reference number on ALL correspondence, you also need to include your name, home address, delivery address of the goods if different to home address, contact details and a description of the faulty item ordered. Once we have received this written confirmation, we will arrange a mutually convenient time and date to arrange collection of the goods to us. Once the goods have been delivered to us, we will complete an inspection. After confirmation of your claim, we will either refund your payment, or arrange for a replacement item to be shipped to you. If replacement parts are required urgently a new payment transaction must be taken before we can send the new parts. Once the original faulty goods are back and have been inspected a refund will be made to the credit card used. 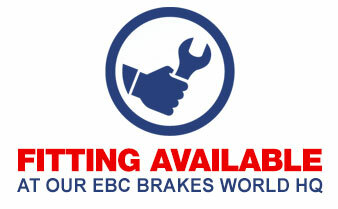 Goods sold from EBC Brakes Direct limited are subject to the original manufacturers warranty terms and conditions. Warranty is invalid if product is used for racing, trackday experience or any other form of competition. There is absolutely no warranty on any EBC product for race use. AUTOMOTIVE - This is a 12 month warranty from date of delivery or a maximum 10,000 miles usage. The warranty will expire, irrespective of mileage, after a period of 12 months from date of delivery. MOTORCYCLE - This is a 12 month warranty from date of delivery or a maximum 5,000 miles usage. The warranty will expire, irrespective of mileage, after a period of 12 months from date of delivery. For ALL warranty claims the customer is responsible for returning the goods back to us. We recommend using an insured and signed for delivery service. Warranty covers defects in materials or workmanship only. Warranty is for replacement of similar product or refund of purchase value only, excluding all labour and ancillary charges such as collection, fitting, inconvenience, purchasing of other manufacturers products. For ALL warranty claims you must contact us prior to sending any goods back. This can be via email, letter posted to our address or by fax. You must quote your invoice number on ALL correspondence, you also need to include your name, home address, delivery address of the goods if different to home address, contact details and a description of the warranty issue. Once we have supplied you with a RTN number and emailed you the returns procedure you can then send the goods back to us. Once the goods have been delivered to us, we will complete an inspection which will take between two and four weeks. After confirmation of your claim, we will either refund your payment, or arrange for a replacement item to be shipped to you. If replacement parts are required urgently a new payment transaction must be taken before we can send the new parts. Once the original faulty goods are back and have been inspected and have proven to be faulty a refund will be made to the credit card used. Due to a new policy by EBC Brakes (the manufacturer) we, EBC Brakes Direct Ltd, advise you that the following conditions must be met in order for any Automotive Disc warranty claim to be considered. If you chose to ignore this advice and then appear to suffer “judder” issues which commonly occur after 2,000 to 4,000 miles then you will have to take your car to a Pro Cut Lathe centre and have the discs skimmed / aligned correctly to correct this DTV (Disc Thickness Variation) or “Black Spotting of the disc” problem. If you experience judder in the very first 500 miles or so you have a severe problem with your wheel hub alignment or the discs have not be installed correctly because of excessive disc run out. There are no exceptions to the above rule, as EBC Brakes will not entertain a warranty claim unless the discs have been on a Pro Cut Lathe either at the time of fitting or if a problem occurs. Proof of this will be required, eg copy of invoice. Detailed explanations of “DTV” and “Black Spotting of the disc” are below. DTV develops in a car after 3000-4000 miles caused by runout built in to the car or due to incorrect alignment of the discs at install. This is quite a common fault on modern cars and many cars require a visit to a Pro Cut Lathe centre at every disc change. Drivers also confuse hub distortion with a disc quality issue but in 99% of cases the DTV is a car problem, not a disc quality problem. When new brake discs are installed it is absolutely essential that they run true. All EBC discs are manufactured and inspected to have less than 0.002 inches (.05mm) of run out. If after your new discs are installed they have more than this amount of run out, then there is a run out problem on your car. Even the tiniest amount of dirt or scale can throw these run out figures to five times the factory limit. After installing the discs and tightening them using correct procedures by tightening wheel nuts diagonally with a torque wrench (not an airgun) it is vital to take a few minutes to check disc run out with a dial gauge. If you do not correct distortion above 0.004 inches (0.1mm) at this point you will DEFINITELY experience brake judder within a few thousand miles. The actual cause of brake judder is not this run out figure (it will be almost impossible for you to detect small run out whilst driving) but over a period of time a “thin spot” would develop on an area of the disc caused by intermittent pad contact which is known technically as DTV (disc thickness variation). As you apply the brake pedal pressure these thin spots will cause pulsation. If the vibration or shimmying is noticed on the steering wheel it is usually a front disc problem. The problem is usually only ONE DISC not necessarily the pair. If the pulsation is noticed through the bodywork of the car, such as the seat or brake pedal, it is usually a rear disc that is at fault. The point at which this thin spot or DTV will occur depends on how regularly or irregularly the brakes are applied. If for example you drive 50 miles to work every day and hardly touch the brakes, it could appear as quickly as 500 miles. The reason for this is that regular use of the brakes tends to wear the whole surface of the brake disc at the same time whereas driving the vehicle “off the brake” causes an intermittent contact between the pad and the high spot on the disc wearing this high spot down and causing DTV. You can replace the discs as many times as you like trying to solve vibration and the problem will only go away for a few thousand miles and then return. This means you have purchased new discs in good faith but the problem IS NOT SOLVED AND WILL NOT GO AWAY PERMANENTLY until you have your discs skimmed with a Pro Cut Lathe. After this skimming of the disc surface you will have smooth brakes, more effective brakes and ZERO vibration. It is even a very worthwhile practice when fitting new discs to have all four discs skimmed into perfect alignment on your car with this inexpensive procedure. The second cause of brake vibration is black spotting of the disc which is caused by the disc over heating and a hard spot occurring intermittently around the disc surface. In technical terms this is the formation of cementite which is a very hard by product of cast iron (disc material) caused by over heat and sudden cooling. If you witness black spotting the only solution is to replace the disc or have it skimmed. Black spotting occurs when the disc has either worn too thin (having been skimmed more than once), or by brake pads that are ineffective in balancing disc and pad temperatures. The problem for the consumer today is that all brake pads look the same and people rely on the expertise of the guy across the counter who sells them their brakes. The design of brake pad materials is a very exact science and the difference between a company who knows what they’re doing and one who doesn’t is a few percentage points. Brake pads need to have good “thermal conductivity” to take the heat away from the disc, optimum “compressibility” to allow the brake system to absorb or dampen minor vibrations and optimum “scrub factor”. The latter is the ability of the pad to hone out minor surface imperfections on the disc as they occur without wearing the disc excessively. All three of these design criteria and a few hundred more are things that EBC Brakes specialises in. No warranty is offered when a non-EBC pad is used with an EBC disc. For discrepancies regarding quantity you must notify us in writing, by email, fax or post within five days of delivery. You must quote your order reference number on ALL correspondence, you also need to include your name, home address, delivery address of the goods if different to home address, contact details and which items are missing. We shall then investigate your claim with the courier company concerned. Providing your claim is of a genuine nature, we shall at your option either refund the cost of the item/s or send the item/s to you at no cost to you. Refunds will be made back to the original payment method within 30 days of receiving the goods back to us. Once we have processed a refund you will receive a “credit note” via email or post if no email address is available. The refunded amount will be back in your account / on your card within 2 to 5 working days from the date of the credit note depending on your bank. 5.11 ANY CLAIMS, WHICH PROVE TO BE FRAUDULENT, WILL BE REPORTED TO THE RELEVANT AUTHORITIES, IN THE RELEVANT COUNTRY, IMMEDIATELY. WE WILL ASSIST THE INVESTIGATING PARTIES IN EVERY FORM POSSIBLE. Your details that we hold are; Your name, home address, delivery address, contact details and purchase order history. This data will not be disclosed to any third parties, unless required to do so by law. Re: Data Protection Act 1998. You have a right to a copy of the data that we hold in your name. Should you wish to have a copy, please email data.protection@ebcbrakesdirect.com stating: Your Full Name, your home address and your email address registered with us. This information is held on our servers, securely, behind a "Firewall" at our Internet Service Provider. "Per-session" cookies are used on this site to maintain your cart and login during your visit. "Per-session" cookies are small text files that are placed on your hard drive by this website and are removed when you close your browser. These cookies contain a unique string, but do not contain any personally identifiable information. By clicking "log out", or by closing your browser, the cookie will be marked as expired. A new cookie will be created when you re-visit the web site. External Links contained within EBC Brakes Direct Ltd. This web site contains many links to other sites. 7.1 EBC Brakes Direct Ltd cannot be held responsible for any content, of any of the external links provided, in any way what so ever. 7.2 You must not misuse our Website by knowingly introducing worms, logic bombs, viruses, trojans, running any scripts of any kind without our consent or other material which is malicious or technologically harmful. You must not attempt to gain unauthorised access to our Website, the server on which our Website is stored or any server, computer or database connected to our Website. You must not attack our Website via a denial-of-service attack or a distributed denial-of service attack. To the maximum extent permissible by law, we will not be liable for any loss or damage caused by a distributed denial-of-service attack, viruses or other technologically harmful material that may infect your computer equipment, computer programs, data or other proprietary material due to your use of our Website or to your downloading of any material posted on it, or on any website linked to it. 9.1 So far as the law permits, we disclaim all representations, terms, conditions and warranties (including those relating to satisfactory quality, merchantability, fitness for a particular purpose, title, non-infringement and freedom from computer viruses) relating to products provided to you by us. 9.2 So far as the law permits, we will not have any liability to you (whether or not caused by negligence) relating to products provided to you by us for any indirect, special, incidental or consequential damages. This includes loss of data, loss of income or profit, loss of goodwill, damage to reputation, damage to computer software and other computer or storage systems. 9.3 We will have no liability to you if you sell on any products provided to you by us, including without limitation, any liability to third parties for defective products. 9.4 Whilst every effort has been made to give accurate application information, EBC Brakes Direct Ltd are not responsible for claims or costs arising from non-fits (parts supplied do not fit your car, bike, mountain bike or kart). No claims for Labour charges will be entertained. 9.5 All items sold are packed and sealed by the manufacturer. EBC Brakes Direct Ltd is not responsible for any losses or costs incurred directly or indirectly, as a result of defective parts or incorrect parts contained within the product boxes. We will not be held responsible for any failure to deliver goods ordered by you or any delay in delivering goods ordered by you or any damage to goods ordered by you, the cause of which is any event or circumstance beyond our reasonable control. All designs, text, graphics and their selection and arrangement on this site are the copyright of EBC Brakes Direct Ltd or its content providers. As a visitor to the EBC Brakes Direct web site you are licensed to copy electronically or to print portions of this site for your own personal, non-commercial use. Any other use of materials on this site without EBC Brakes Direct Ltd’s prior written consent is strictly prohibited. We respectfully acknowledge any copyrighted term, make or model of any of the manufactuors of the Automobiles, Motorcycles, Karts and Mountain Bikes listed within the catalogue data as being their copyright. 13.1 This Agreement supersedes all prior agreements, arrangements, warranties and understandings between the parties and constitutes the entire Agreement between them relating to its subject matter. 13.2 These terms and conditions cannot be varied except in writing signed by an authorised person at EBC Brakes Direct Ltd.
13.3 Nothing said or any representation made by any employee, including but not limited to our telesales staff, should be understood as a variation of these terms and conditions of the sale or as an authorised representation about the goods provided. Our disclaimer of liability shall include but not be limited to misleading and untrue representations but shall not include fraudulent misrepresentations. 14.1 Where these terms and conditions have been translated into a language other than English, any conflict or inconsistency in the translation, the English language version shall prevail at all times.